Whether you are decorating your house or office, you cannot afford to overlook the walls. This is because a wall is the first part of the house that every visitor who will enter your house will see. 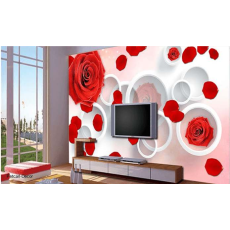 If you want to create a visual focal point in the living room without the need to paint your walls, a rose flower wall mural is a fantastic way to achieve an amazing look. Modern wall murals are a fantastic addition to any home due to their adaptable shape and design. Whether you need to install a wall mural to act as a statement or you simply want to bring a new look in your house, a decorative wall mural can help you achieve the look that you desire. They are made of high quality material which is wipeable and durable. Need to transform the look of your house? You can visit Petcarl Décor to buy decorative and classy products that will enhance the beauty of your house.